Can anyone help with this? Its got a few scratched marks to the base. I think this is Reijmyre (PAUL KEDELV ?) not Kosta, both because of the look and signature. Last two similar bits on Ebay went in the region $70 ish. Yep looks more like his style than Kosta but I thought he was connected with Flygsfors rather than Reijmyre ? .....oops a quick check in the books shows he worked for both. Thanks for the information folks. PAUL KEDELV thats a new name for me . Ill start looking him up. Great forum this - Ill have to try a few more long unidentified pieces on you. Paul Kedelv left Flygsfors and went to work for Reijmyre. He was there from 1956 to 1957. A lot of his Reijmyre work is very similar to his Coquille range at Flygsfors. 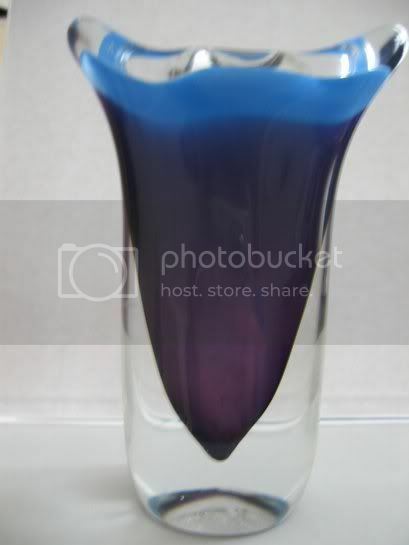 Look at this vase by Kedelv for Reijmyre. It is signed "R-e -57, K 16". as a comparison, here is the Flygsfors dogbone I picked up last week. Ivo's book has him at Reijmyre only in 1956 to 1957. He then has him at FÃ¥glavik glasbruk from 1957 to 1976. I don't know anything about FÃ¥glavik glasbruk. Another mysterious Swedish glass company! information about Paul Kedelv's years at Reijmyre. My source for this information was "Lyricism of Modern Design Swedish Glass 1900 - 1970" a catalog for the exhibition of Swedish glass in Japan. Kedelv was there from 1956 - 1976. This was my source but I will go back to Gunnel, who I will see next week and reconfirm this was not a typing error on the part of the editor. Ivo, please recontact me. We live in Sweden now. Page created in 0.654 seconds with 27 queries.